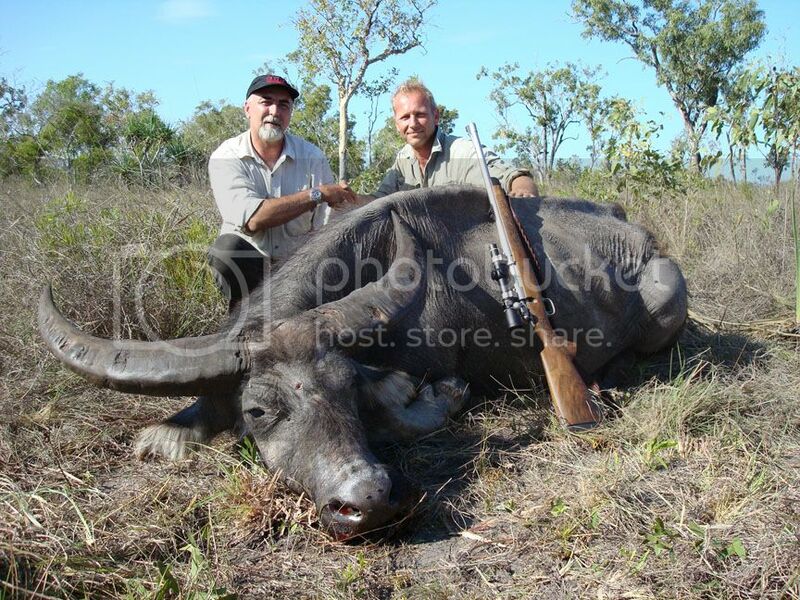 I felt like this would be the proper place to do this, so I would like to report on a tremendously successful hunt with Paul Truccolo, Australia! This was my first trip down under and I really had a blast with Paul! I found him to be a true gentleman, sincere, and honest. 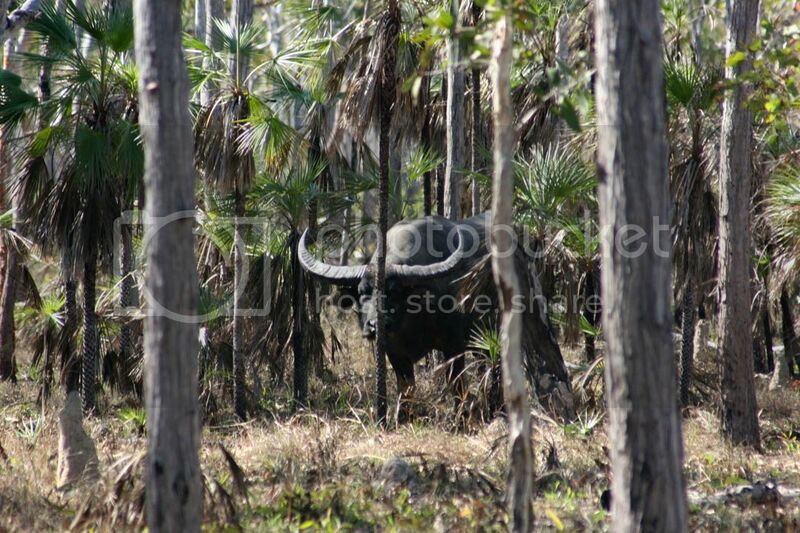 Paul has a great area, or concession and it is loaded with buffalo! 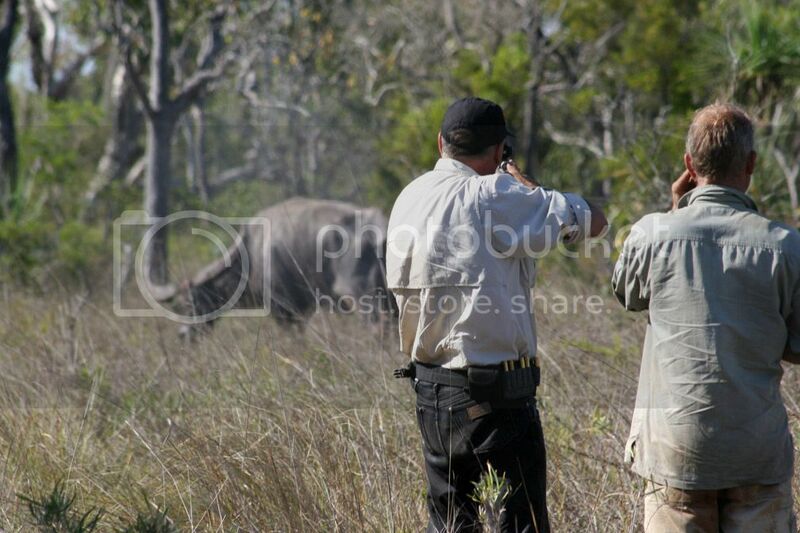 Buffalo was our goal, primarily one of Paul's "Herd Reduction" or "Selective Removal" hunts. With trophy buffalo as an option. I used the option too and took 4 very good trophy bulls! This is the first bull taken! An excellent old bull past his prime! My second bull, very much in his prime! 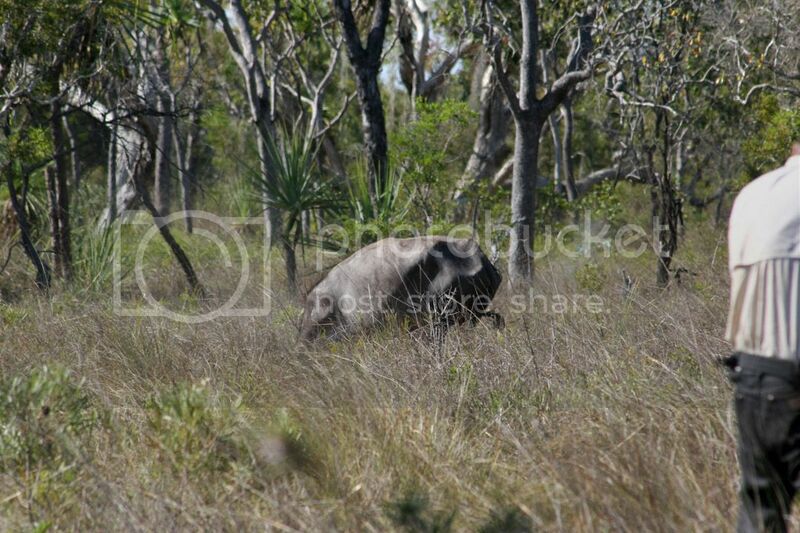 And the grandaddy old bull and the last animal on the trip. Ended on a tremendously good note! It was a great trip, no shortage of excellent shooting available! 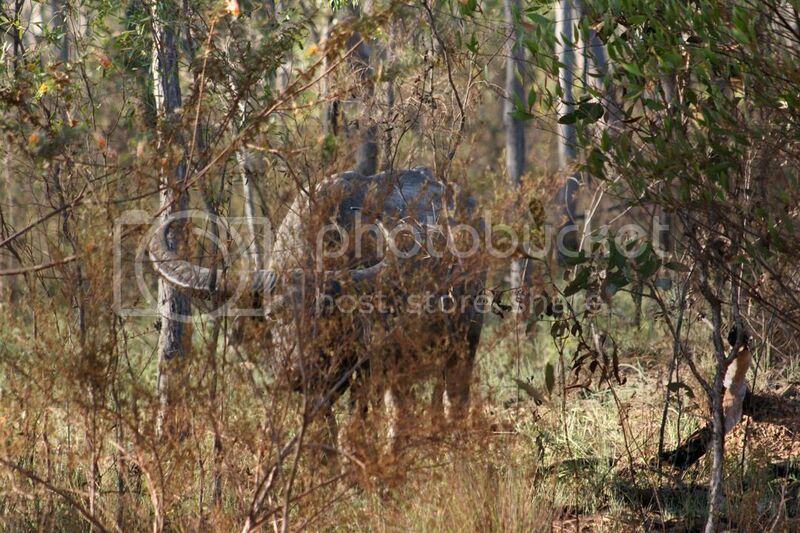 With the 4 bulls included I managed to get a total of 20 buffalo on the ground! My wife went along too, and it just so happened that Paul's wife Deidre was in camp with us and they got along famously, and added a special quality to the experience. Both Paul and Deidre are excellent hosts and great people to spend time with. Camp was great, camp personnel were fantastic, and there were zero downsides to being "Down Under" with Paul Truccolo! It may take me a year or two to get back, and work another trip into my schedule, but rest assured it is only a matter of time before Paul finds me in camp again for another great hunt! Paul's Website for more information. If you ever considered a trip down under for buffalo, Paul is your man! What a bunch of bull(s)! Those are fine animals. Congratulations on a good hunt. Thanks Steve, it was a great time! 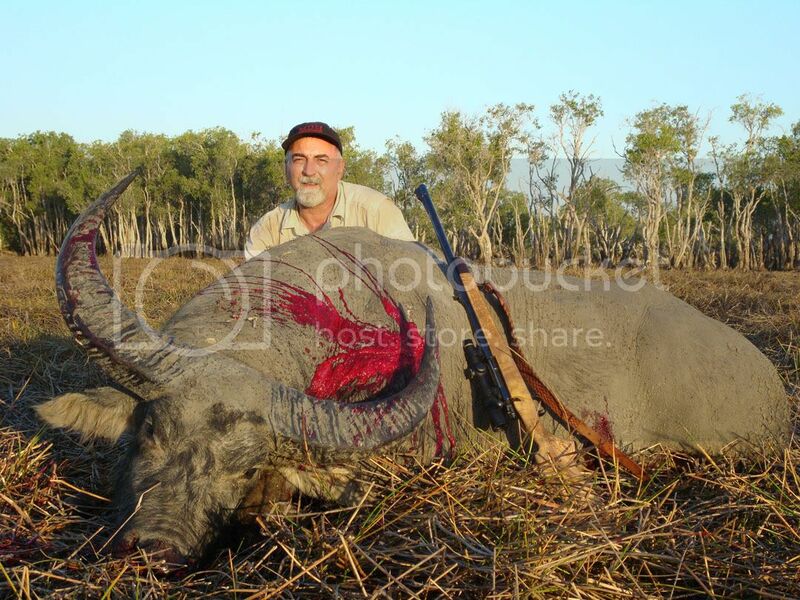 Heres the old grandaddy bull before the shooting started! Here is another bruiser that we saw but did not hassle! In fact he was just a bit aggressive at one point! What an adventure! Congrats on safe and successful trip. How many days does a guy need to smack 20 buffalo? Generally, what were you shooting for the population control buffs? Females? Young? What was the "trophy bull option"? Just pay a trophy fee or was it a trophy fee plus a premium? If you want to send me a PM, that's fine, but I'd also like to know about what a hunt like this costs "all in". Auburn University Tiger - War Eagle! 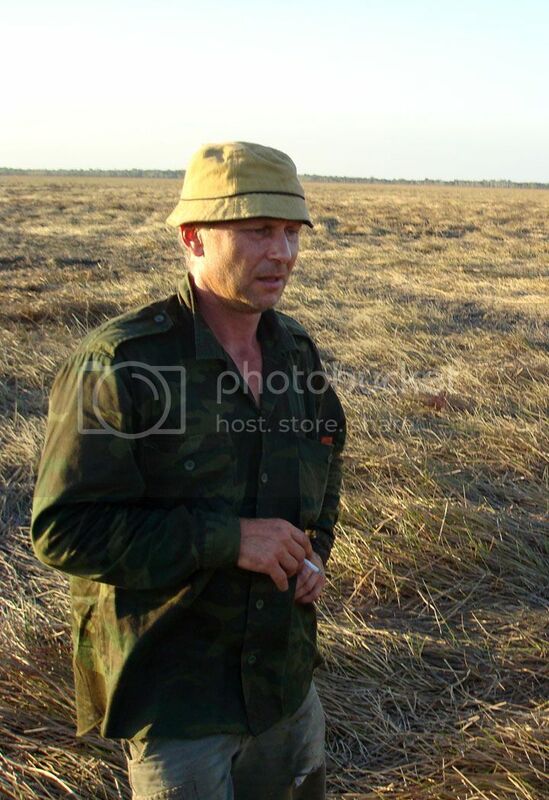 Well we spent 10 days in camp, but I really spent about 8 in the field. My wife got a bit under the weather and I spent one day in camp with her. 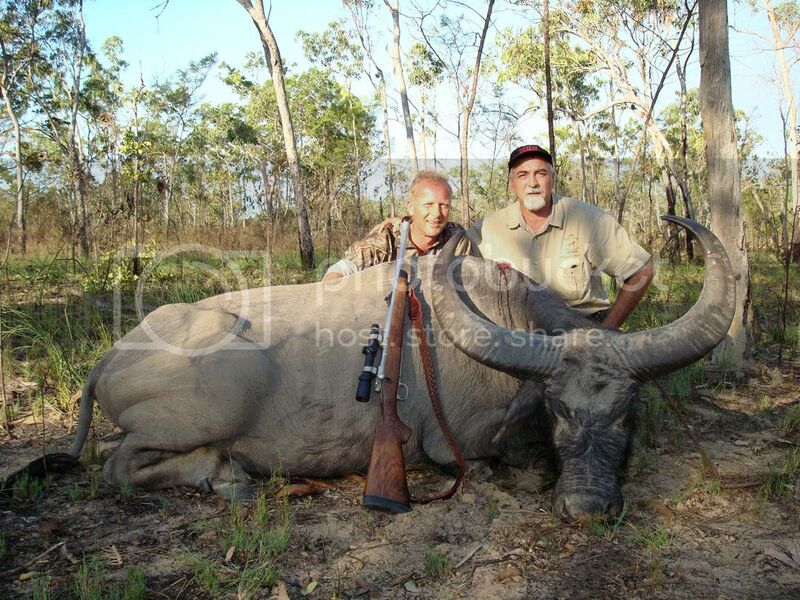 Trophy bull--just an additional trophy fee--no "Premium fees". Go over to the web site, it can tell you more than I can. 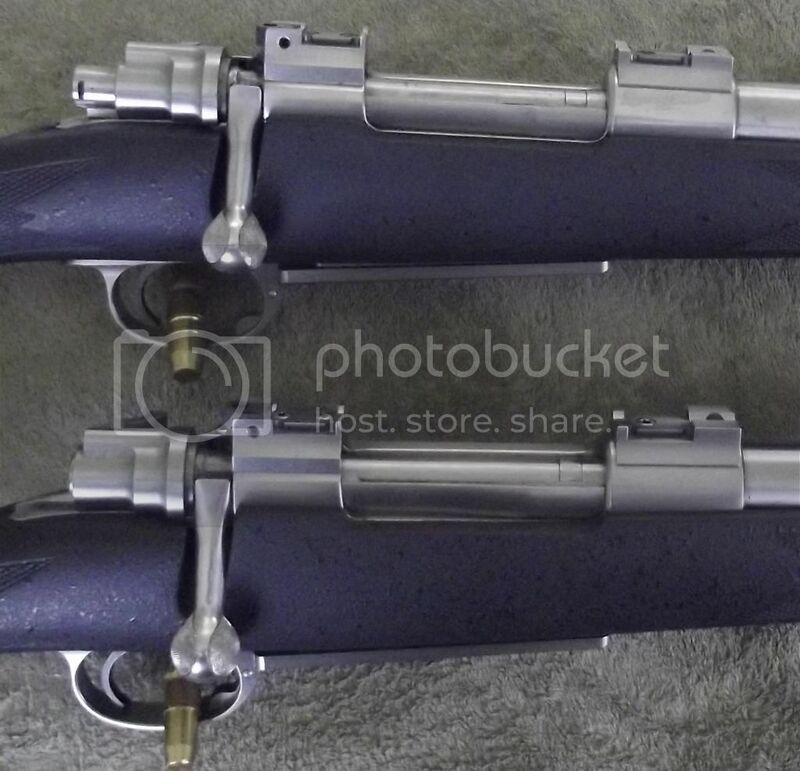 Looks like 2 different rifles were used, what kind of pea-shooters did you use? 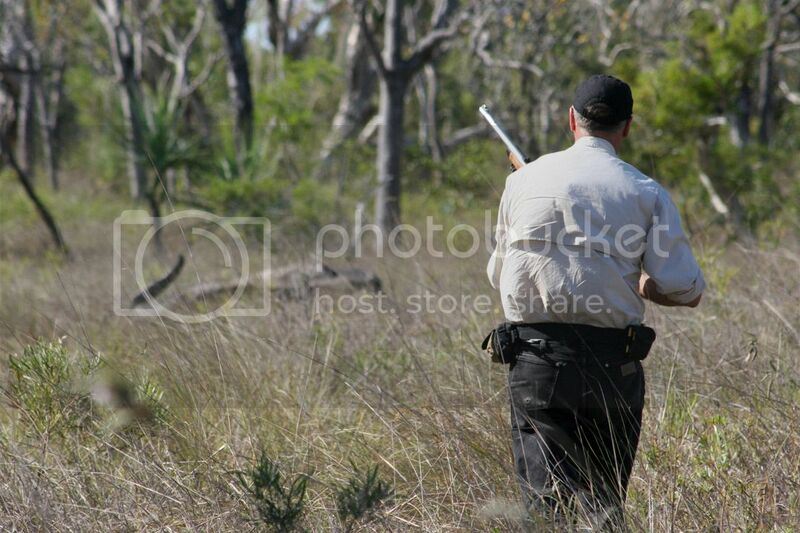 Very nice photos Michael...great hunt! Some real nice bulls there - congratulations!! I heard there was a cook from New Zealand, made the best camp oven bread ever! Nice to know you made it home safe, enjoyed my time with you guys. It looks like a few different rifles were used, can we get some details? Damn good to hear from you, and glad you made it home safe! Now the big news---what's the story on the baby?? Any baby news yet?? Sure hope the photos are correct, otherwise you might have to do some pinching off!!!!!! Boys, this here is the "CHAMPION" KIWI bread maker in all the WORLD. Not just the south pacific, but all the world! 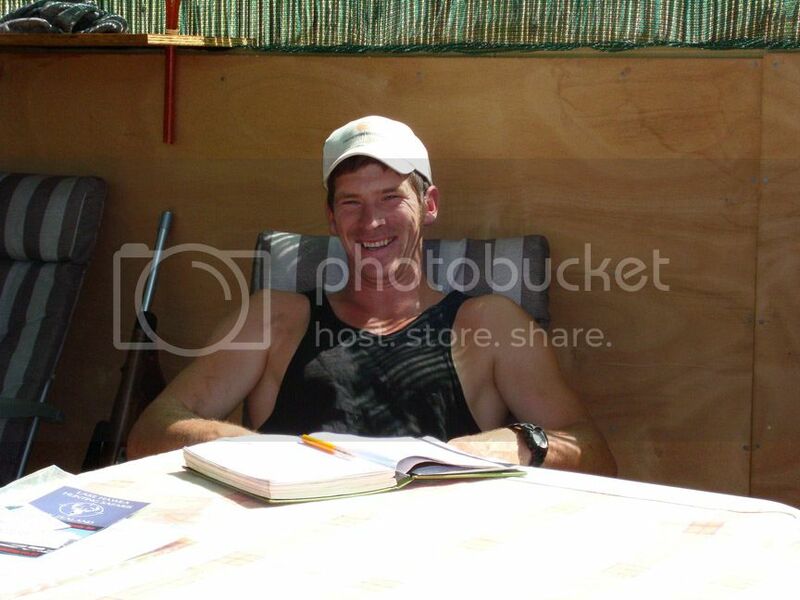 Chris was in camp helping out Paul for some of our stay, and also runs his own operations in Kiwi Land! If ever you want to go to New Zealand for some hunting I suggest that you take a hard look and talk with Chris---the bread is worth the trip alone! The best Bread Maker of All Time! Chris, we had a total blast over with you and Paul! Thanks so much! Will be happy to get PM, I can assure you that you will be very pleased if you book with Paul! I have hunted many places in the world and this I can say was a fine hunt with very fine people! You will not be disappointed! Thanks too! As for the rifles I am doing a report geared to the rifles down on Big Bore. Today maybe if I get time. I tend to be more of a shooter, and all my hunts, or shoots as I refer to, are some sort of test mission for cartridges, rifles, bullets, what have you! 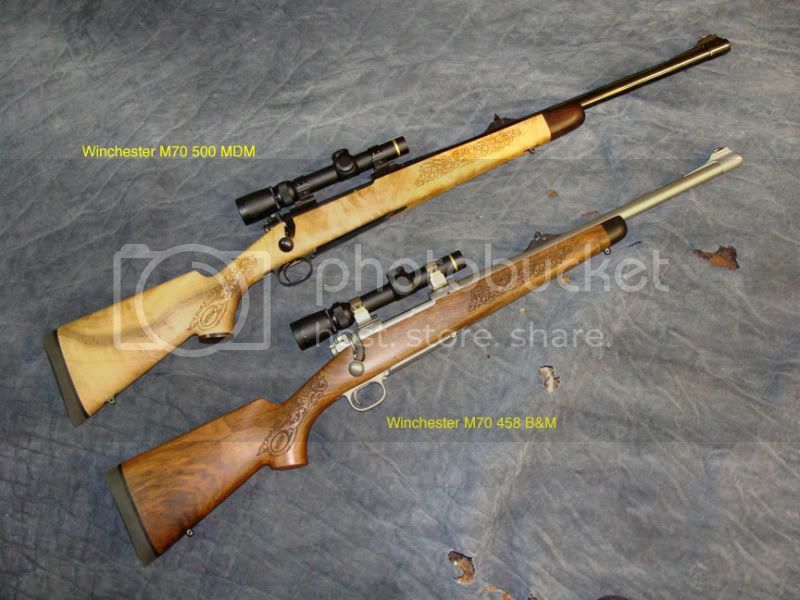 The two rifles you see are both Winchester M70s one in 500 MDM and the little one in 458 B&M, both cartridges I designed and developed. I was very impressed with both on this trip, and got to do enough shooting to give both rifles/cartridges a proper workout and field test. Of course I have done all the "lab work" and bullet test work before going. I have a thread on Big Bore concerning many of the cartridges that can tell in detail about them and the rifles. 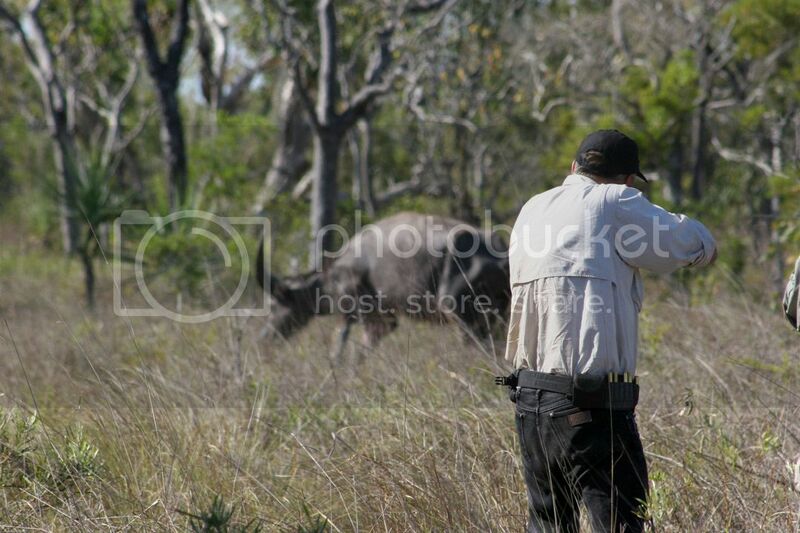 But like I said I am doing a specific report on this hunt down on Big Bores, so drop down and take a look! Thanks. That photo must have been taken after one of your jokes..... Had a great time with you guys, a laugh a minute. No baby yet, due day is Sunday, so we should get one on the ground some time soon! Congrats on the big lunar bull, he's a cracker. Hope to run into you guys again somewhere down the line. Haven't heard from Paul yet must be due home soon. I think Lewis and Craig make it home today. Keep up the good work with your rifles, made my jaw drop when I saw them, made those buff drop pretty quick too! Oh yes you were not there for the last old bull, I forgot you had not seen him! Oh he was a fine way to end a great hunt! Keep us posted on the baby situation! I am sure we will hook up somewhere! I think Paul is going to be back in a couple more weeks, doing some things around camp and building some roads as I understand! Glad you liked the rifles too! Ah CRAP! If I had of known you were coming I'd have asked you to bring some of your short 458 B&M dies. Serves me right for not paying attention! 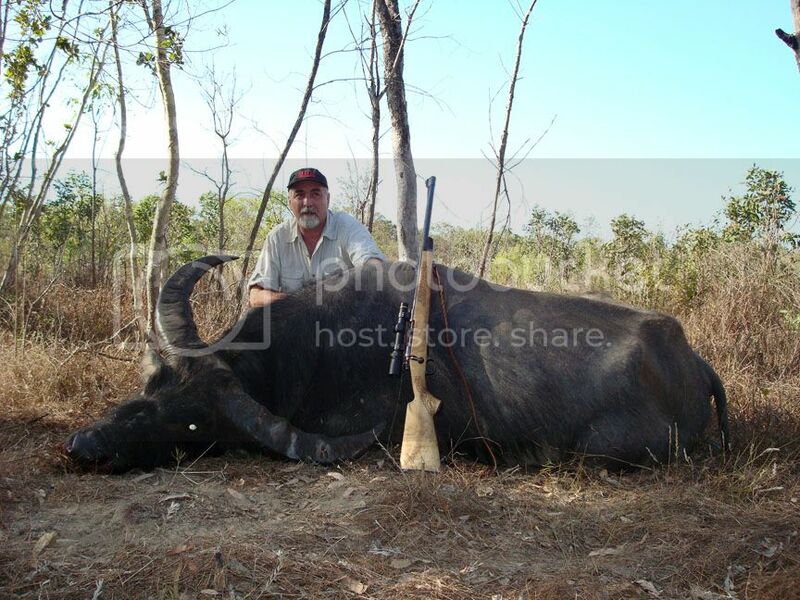 Great pictures and now you need to come South for a Sambar hunt. Did not know you needed any 458 B&M dies??? I have a buddy coming over from OZ on October 19th and I have a pile of stuff shipping over with him! He is taking a 50 and 416 B&M back to Aussie land. Michael did you have any issues with Australian customs with wildcat rifles?? 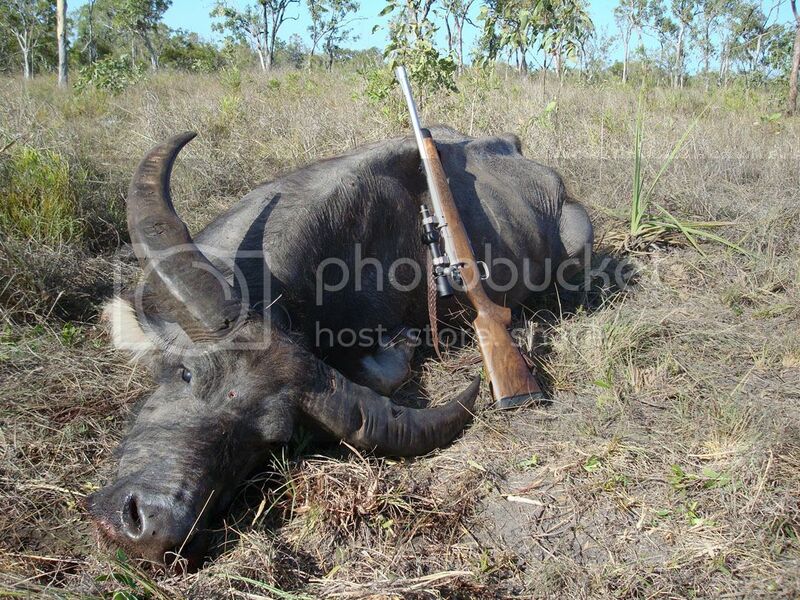 Is that Elephant hide rifles are laying on?? Both Short & Fat and I are closet admirers of the short action 45cal. With the dollar perking up again, a WSM Ruger and Howa action here ... and I've decided to use 375RUM brass for the 458AccRel leaving me about 250-300 spare 300RUM cases ... this would make a nice project! PM me if you can send a chambering reamer and headspace guages at a later stage and we'll talk shop. Barrels from the States are now verbotten thanks to your farkin' stinkin' Govt, so we cant access PacNor pre-chambered stuff. No offense meant against the USA ... but we're worst off than the Taliban the way we're being blocked at every step from getting parts etc out of the States. I want one, some how we need to make it happen. I don't call myself ShortandFat because I'm "Short" and "fat"
I'm tempted to use my 300 WSM Winchester featherweight as the base rifle with a 20 - 22 in stainless barrel. Calibre of choice...........458 primarily for bullet weight selection. No I did not have any issues at all. Paul helped me get a permit far in advance, when I filled out all the documents, I sent photos of rifles, cartridges, and a full letter explaining about each so there was zero confusion. When able to get a permit ahead of time I always do this, even in South Africa and other places. It explains in detail what they are about. Yes that is elephant leather. It makes for good contrast and photos. Wow Con and S&F--I am very much humbled, did not know you guys were fans of the B&Ms. I appreciate that a bunch. I got the PM and will answer later this morning (my time here) I will do everything I can to get you guys set up! I heard you had a bit of a target session at the end of the hunt to use up excess ammo. Also heard that a couple of the boys got weatherby eyebrows, or idiot rings as we call them in NZ. One of your buddies has been in touch, cheers. Yes, I had the boys do some shooting with both the 500 MDM and the 458 B&M. I did not cut them any slack either, made them fire several rounds each, not just one! Poor Lewis, he did not have a good tight hold on the 500. I assume that would be Robert! Excellent, hope you guys can work something out! Hope your hunt is not too rough on him? I think that climbing might kill me on out, being old and fat as I am! Not sure if its a good or bad thing I missed that target session. I know I'd have been pretty ginger settling in behind the 500. But you know what its like when the boys get together, you got to man up. I reckon those roaring red stags would pull you up the hill, infact I reckon you'd be running! Its amazing where you can get people by taking one step at a time. Yes was Robert thats been in touch. Great trophies. it seems the company at camp was great also. I am sure had you been on the scene you would have manned up and done well, like everyone else! Roaring stags--up the hills? Maybe, but might have to carry me the last few 100 yds? HEH! Let me know how it goes with Robert--he is a fine fellow! Thanks, we had one hell of a good time with Paul! If you ever think about going, look up Paul, I can't give a higher recommendation than Paul Truccolo! He's the Man! Have a look and give me your opinion? 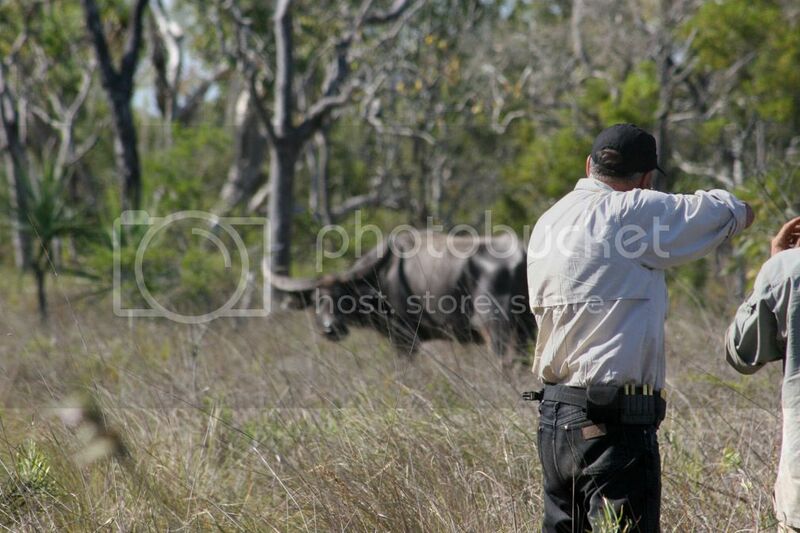 This is a series of photos my wife took while I was sorting out the #3 bull of the 4 I took. Great photos Michael,do you have any more?? Was that bull limping really badly Michael?? We saw a broken-down bull like that from the air last year - it looked identical. If it is the same one it is not impossible that he could have traveled that far south. You know I did not notice a limp. His head was turned away as I came up behind him, and he turned his head only to me as you see in the first two photos, he did not walk. But after the first 450 Swift A frame hit him in the shoulder he did have a very serious limp from there, I think maybe he stumbled his length as he caught a couple of solids in addition. I did notice the limp got much worse from that point. Actually for real where you see he looks like he is limping is him taking the first 450 Swift from the 458 B&M. By the last photo where you see me walking to him he took two of the solids, I am actually reloading as I walk up, not that there is a need, but I do love to shoot! Sort things out with Paul yet? I doubt it as I am not sure he has made it home from camp yet, but he should be there within days I would think. Oh yes, have lots of photos of different things. I will continue to look thru them and if I find anything of interest I will post it. In the meantime have you gone over to big bores and checked out the report there, mainly concerning rifles/cartridge/bullets??? If not go check that out too. Whichever way, his time was up!! Somewhere I actually have a photo of that bull that the guys saw from the air. 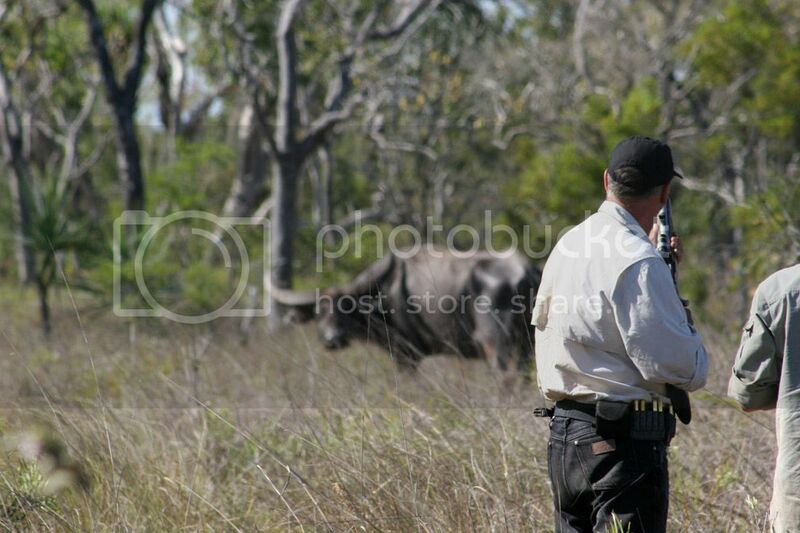 We had a helo doing aerial shots last year for a TV show and they photographed the bull. Be interesting to see if he is the same... this one was very broken down in the back end... I forget what the pilot said but something broken down in this leg. I lost all my 2008 images when I had a laptop explode ... just been struggling to get them all back from the various sources. Michael is that a bullet entrance or exit hole between the eyes in the last photo? Yes, I think his time ran out in short order, little 458 B&M did a job on him. There were lot's of broken things when I got to him, at that point not sure what from, but suspect lead poison to be the cause. Not only that, but only someone such as yourself or Paul could tell anyway, unless very distinct like the last bull I shot they all look the same to me. I really was pleased with all the old bulls. Yeah, ugly hole in the head, just had to do that could not resist it, finishing or insurance shot with 450 Barnes solid. I did a few that way, don't know exactly why, most of the time I do the spine, but it did tend to sort things out quickly! In thinking this over carefully I think maybe the story should be like some famous hunters with the DVDs and the tapes. Imagine being faced with charging "Black Death" upon you, you raise your trusty Winchester M70 chambered in 500 MDM, firing 550 gr Solids at 2200 fps. You wait, here he comes, you wait a little more, just as he is within a foot or so of the muzzle you squeeze the trigger, and he takes a nose dive right at your feet, you have to scramble backwards to keep from getting bulldozed, camera man jumps back, camera is going wild at that point, up, down, around, finally it focuses back to you as you turn towards it and state for the audience, "Always, Always Use Enough Gun". Hmmmmm, yeah, maybe that's the story! Nahhhh, come to think of it, if it gets to that point you screwed up from the start! Guess I will stick to the truth--finishing shot to the head just for the hell of it and don't know exactly why, just did it! I don't know I kind of like the TV/DVD/CD/VHS version!